We love Chinese food. Claire, my four year old, could eat her weight in sweet and sour chicken. And Matt’s not far behind her. This recipe is stellar for entertaining people because you’re baking the chicken after a quick fry. You could do the quick fry the night before so that all you need to do is add the sauce and bake. Also, because you bake it, you could easily take it with you to someone’s home. 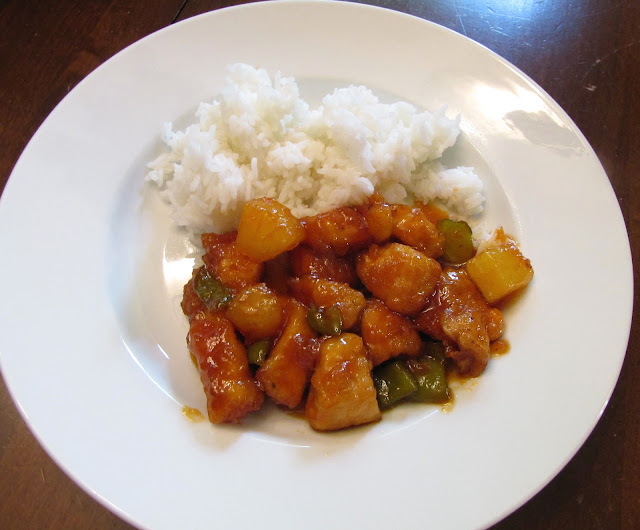 We made the sweet and sour but Matt loves spicy food and thought this recipe would work brilliantly for General Tso’s chicken. And it does. So below I will have the sauce for either recipe. Adapted from recipe at Life as a Lofthouse. Step 1. Preheat your oven to 325 degrees. Step 2. Mix all your sauce ingredients in a bowl with a whisk (excluding the green bell peppers and pineapple for the sweet and sour sauce or the Thai chile pepper for the General Tso’s sauce; you will stir those ingredients into the sauce after you have combined all the other ingredients). Step 3. Rinse your chicken breasts in water and then cut into cubes. Step 4. Season with salt and pepper to taste. Step 5. Dip chicken into the cornstarch to coat then dip into the eggs. Step 6. Heat your 1/4 cup oil in a large skillet and cook your chicken until browned (it doesn’t need to be cooked through). Step 7. Place the chicken in a 9x13 greased baking dish. Step 8. Pour evenly over the chicken and bake for one hour. Step 9. During the baking process you will need to turn the chicken every 15 minutes.